Happy Spring!! We are so excited to bring you some new, beautiful Spring wreaths to welcome the much anticipated season! As you may know, we’ve closed the doors to 13 Bow Street! We are so thankful for the successful 37 years we experienced in Freeport, Maine. We are not done yet, though! We will be selling our handcrafted wreaths, centerpieces and unique garden and home decor items right here in our online shop! We were thrilled to bring a piece of Maine to families all over the country this past holiday season! Our handcrafted Winter wreaths graced the homes of so many, from east to west, north and south! 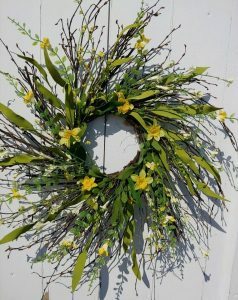 Start the season right with one of our newly designed spring wreaths, shop now with Free Shipping! Hi Anne! It was bittersweet, for sure! We are still carrying fairy garden and other garden decor items on our website! If you don’t see what you’re looking for, please e-mail us at shop@mainewreath.com and we will do our best to accommodate you!